Recently there was a discussion on Book Connectors, a Facebook group I am a member of. (Bloggers and authors, if you’re not already part of this, look it up – it’s a great group!) The discussion was about prologues and whether people bother to read them or not. Now I always do – why wouldn’t you? – though often forget about them until the relevant part comes up later in the book. The prologue in this book is certainly one that grabs your attention. A woman and her child wait outside a prison while her husband is hung for murder. Another man is beaten to death with a spade by a young woman while her friend looks on. These are The Silent Girls of the title and my goodness what a lot they have to be silent about! In the present day, Edie has come to help clear out her aunt’s house following her recent death. She is shocked by the squalid conditions her aunt has been living in. The street is notorious for five vicious murders of young women many years ago and it’s not the most salubrious of places, now with prostitutes and gangs often hanging around. As Edie starts to go through the filthy house, with the help of homeless girl Sophie, secrets begin to be revealed. There was so much going on in this book as secret after secret is revealed. Along with Edie, I could hardly believe all that had been going on and covered up. Talk about skeletons in the cupboard – almost literally! I noticed a sentence which summed it all up for me: “It seemed that every time a stone was turned in number 17 a new set of confusing circumstances crawled out from underneath”. This is a book that constantly took me by surprise. It is well paced and the revelations are cleverly exposed as we build up the picture of what has happened through the viewpoints of the different characters. 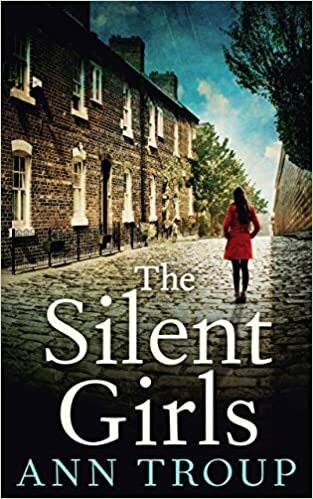 The Silent Girls is a fabulous read that will have you turning the pages wondering what on earth can happen next! So many twists and turns will keep you wanting to read and guessing right up to the last page. Thoroughly enjoyed this and will be keen to read more by this author. What if everything you knew was a lie… This house has a past that won’t stay hidden, and it is time for the dead to speak. Returning to Number 17, Coronation Square, Edie is shocked to find the place she remembers from childhood reeks of mould and decay. After her aunt Dolly’s death Edie must clear out the home on a street known for five vicious murders many years ago, but under the dirt and grime of years of neglect lurk dangerous truths. For in this dark house there is misery, sin and dark secrets that can no longer stay hidden. The truth must come out. Finding herself dragged back into the horrific murders of the past, Edie must find out what really happened all those years ago. But as Edie uncovers the history of the family she had all but forgotten, she begins to wonder if sometimes it isn’t best to leave them buried. Oooh, love the sound of this – and what a great start, with that prologue! Another one to add to the ever-growing TBR pile. I thought the prologue here was brilliant – very intriguing and something to keep thinking about as the story progresses. I am currently about 2/3 the way through the book and only now working out who was who in the prologue. As for readers who skip prologues – that’s stupid and also disrespectful to the author. The author has constructed the book in the way they think best tells the story. If you then decide not to read parts of it, then you won’t get the experience from the novel that the author intended. I’m an author. I sometimes use prologues, but not always – it depends on the story and the way I want to tell it. Exactly, why would you want to deliberately miss out a part of a book!